School Principal Gearoid O'Ciarain and Minister Simon Harris pictured in May of last year at a topping out ceremony, supposedly to mark the launch of the two new school buildings. Both schools have remained unoccupied to this date. 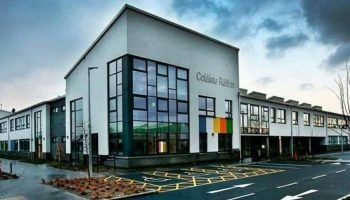 Tensions have reached boiling point for Coláiste Ráithín and Ravenswell Primary School in Bray as the completion of their buildings has gone into limbo once again after another building company has announced its liquidation. Principal of Coláiste Ráithín Gearóid Ó Ciarán said the news had not come as a surprise and the collapse of Sammon was to be expected. 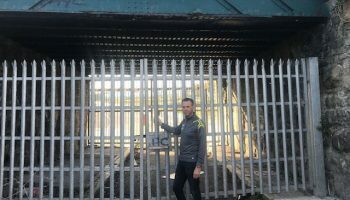 Mr Ó Ciarán said “The only thing we want to see now is a new contractor brought in that can actually complete the project. All we’re receiving from the Department of Education and Skills is PR-style emails with promises that aren’t met, we can no longer take anything at face value. “Parents are so annoyed as everything in the building is completed, all that is left is grounds work that would take no more than two or three days,” he added. Irish building company Sammon Group — who were subcontracted to build the schools by now-collapsed UK construction giant Carillion — will no longer be able to complete the tender after the sudden suspension of work had put the company in “a perfect storm”. 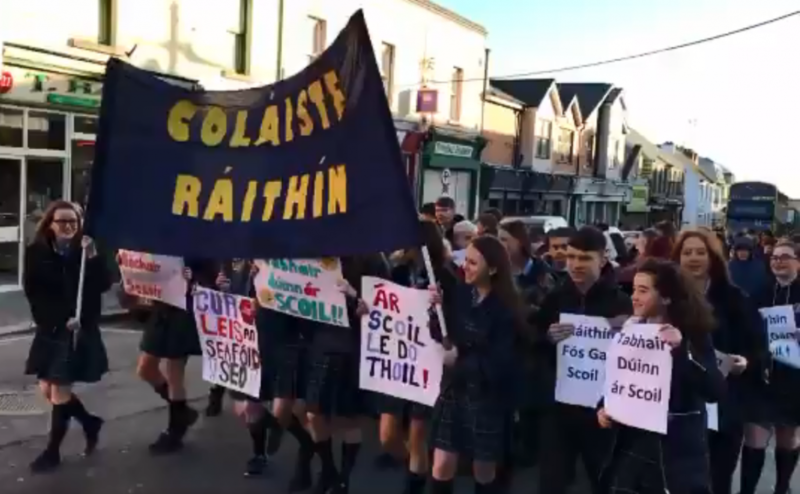 February 2018: Students of Colaiste Raithín marched in protest of the uncertainty of their new school building. In a statement, Sammon CEO Miceál Sammon said the company had made every effort to get the contract restarted in the interests of their business, their contractors and the school communities. Sammon Group had entered into examinership after the collapse of Carillion, and Mr Sammon said delay in decisions around these projects inevitably placed the company in an irrecoverable position. Wicklow Fianna Fáil TD Stephen Donnelly has called on Minister for Education Richard Bruton to lay out his plans to avoid further delays to the schools caught up in the liquidation of Sammon Group. “The time has come for the Minister Bruton to step in, provide some leadership, and get these schools open,” TD Donnelly said. “This leadership is needed by the contractors also. They are worried that their businesses will be left unable to pay wages. It is simply not good enough,” he added. Minister Harris said that a new contractor for the project will be announced in the next week.